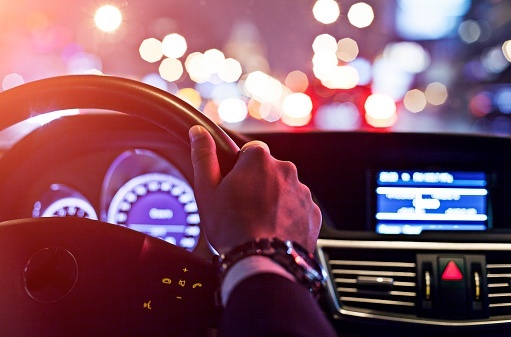 Nighttime driving presents several unique challenges, especially for people who have astigmatism or age-related conditions such as cataracts or presbyopia. But while there’s not much you can do to change the anatomy of your eye or to stop growing older, a second look at your vision correction options can be the first step toward feeling more secure on the open road. Why Is It So Much Harder to Drive at Night? Light can be both a blessing and curse. We need light to see, but sometimes it feels blinding when it’s coming at us at 60 miles per hour on a rainy night. The visual effects produced under these conditions are amplified in people over 40. There are several reasons why this occurs. Even if you don’t have an age-related eye disease like cataracts or age-related macular degeneration (AMD), an older eye isn’t as flexible as a young one is. Most young people can automatically (and subconsciously) adjust the focus of their eyes between near and far distances. But as you age, the eye becomes less flexible and vision leans more toward a constant point of focus. When it’s dark outside, the widened pupils can make vision worse because the light that does enter the eye tends to scatter more, instead of being focused on one part of the retina. Add to this an age-related loss in contrast sensitivity and it becomes obvious why driving at night can be so much more stressful as we age. It’s common to try to compensate for this stress by concentrating harder. But this also makes matters worse since it reduces healthy blinking. The visual effects of these conditions are halo and glare. Halos are the bright circles that you see surrounding headlights. Glare is scattered light that reduces image contrast. If you wear toric lenses for astigmatism, driving at night can be even more difficult since there’s a good chance you experience unstable vision and blur—in addition to the halo and glare discussed above. This happens because toric lenses must remain in a certain position on your eye for the varying distance prescriptions to be where you need them to be, without shifting position. Unfortunately, most toric lens wearers report that their lenses rotate during the day. This lens rotation results in temporarily blurred vision, which can be a real problem—especially when you’re driving. And, since soft lenses can dry out toward the end of the day, they can get stuck out of alignment, making them harder to manually nudge back into place. Tip 1: Minimize distractions: Turn off your cell phone and slow down. Tip 2: Dim the dashboard lighting. Tip 3: If you wear glasses, make sure they have AR (anti-reflective) coating. Tip 4: Have a clean, smudge-free windshield. If you wear contact lenses for astigmatism and struggle with lens rotation, ask your doctor about advanced-technology hybrid contact lens designs that won’t cause blur in the event that your lens rotates. SynergEyes Duette hybrid lenses combine a gas permeable (GP) center (so that the optics are crisp and consistent) with a soft lens skirt (so that you also can enjoy the benefits of comfort and ease-of-wear). Duette lenses are also available for people who don’t have astigmatism. In fact, each Duette lens is custom made to correct nearsightedness, farsightedness, astigmatism—and even presbyopia. There are enough challenges involved in driving at night. Your contact lenses shouldn’t be one of them.